Crossed Souls, known as Crossover Souls (クロスオーバー・ソウルズ Kurosuōbā Souruzu) in the OCG, is a Booster Pack in the Yu-Gi-Oh! Official Card Game (OCG) and Yu-Gi-Oh! Trading Card Game (TCG). It is the fourth set in the OCG's 9th series, following Secrets of Eternity, and followed by Clash of Rebellions. Contains more Pendulum, Ritual, Fusion, Synchro and Xyz Monsters. Includes cards used by Yuya Sakaki, Zuzu Boyle, Gong Strong, Sylvio Sawatari, Sora Perse, Shay Obsidian and Yugo. The TCG version also includes cards used by Yuma Tsukumo, Seto Kaiba, Zane Truesdale, Jack Atlas, Kite Tenjo, Hart Tenjo, and Yusei Fudo. This is the first set since Shadow Specters where Korea receive Ultimate Rare cards. Includes members/support for the "Edge Imp", "Fluffal", "Frightfur", "Galaxy", "Infernoid", "Madolche", "Trap Monsters", "Melodious", "Nekroz", "Performapal", "Raidraptor", "Ritual Beast", "Saber", "Superheavy Samurai", "Shaddoll", "Tellarknight", "Yang Zing", and "Yosenju" archetypes. 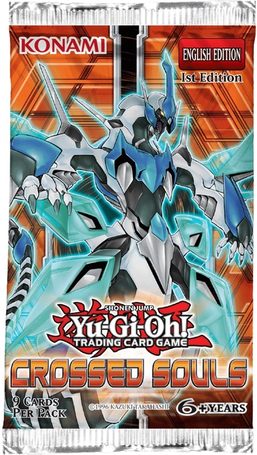 The OCG version contains members/support for the "Atlantean", "Cyber Dragon", and "Fire King" archetypes, and the "Vassal" series. The TCG version contains members/support for the "Burning Abyss", "Draconia", "Harpie", "Junk", "Number", and "U.A." archetypes/series. Introduces the "Void" and "Zefra" archetypes.